There is one absolute tip to follow if you want to confer resplendence in your full-scale kitchen. Go for granite countertops. No terms and conditions applied, large or small, modern or classic, dark or bright, such tops suit any kitchen. Do you wonder why? 10 examples of granite kitchen countertops will be shown here to explain it visually to you. Check these out! In a colonial white kitchen like this one, a grey countertop is the finest option. However, too much neutral tones like white and grey could bring dullness. So, have a blue color tinted the walls and the dining nook is a clever decision. Pops of greens and reds also help in enlivening the monotonous nuance. We couldn’t agree more with ‘granite creates drama’ thing, because it does. Its rich variety of colors makes a statement within the kitchen. 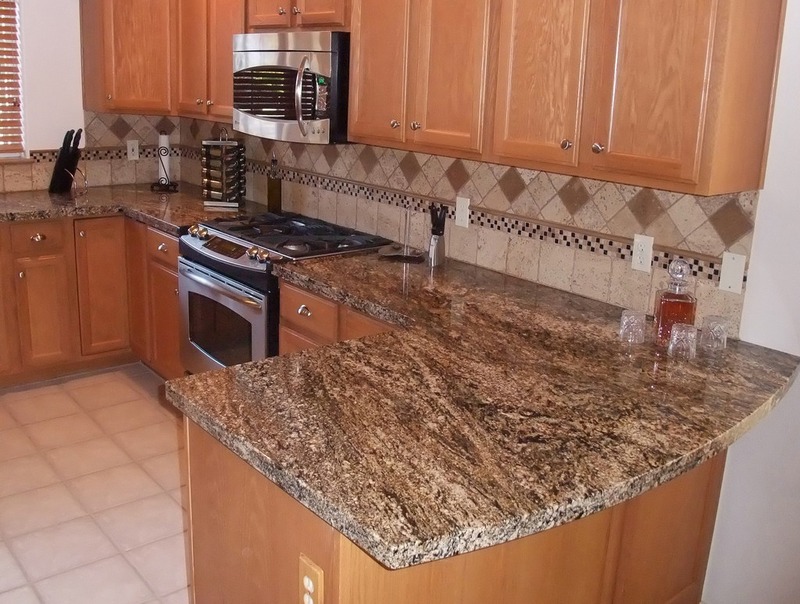 Applied all over the sink area, it proves you that granite has no problem at all with dishwashing job. Among so many options of granite colors, there’s this one that comes in limited production and only excavated in Brazil. This bold selection is so perfect featured in your calm kitchen with a neutral toned backsplash and soft blue painted walls. Who wouldn’t want to do the prep job on top of this kind of surface? 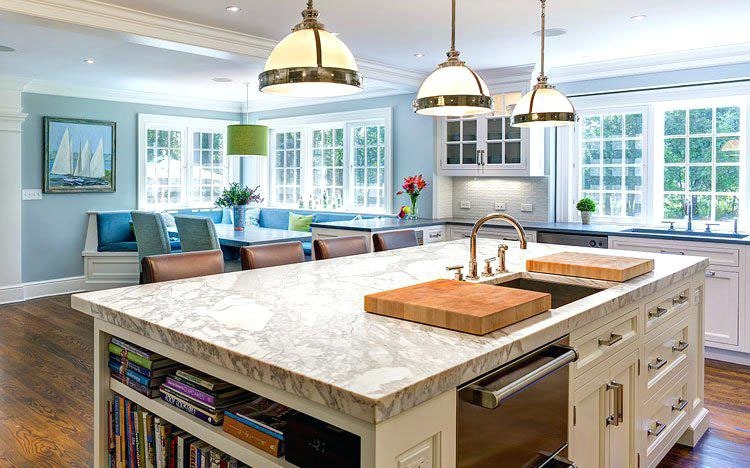 Pure, classic, and timeless are so white granite. Because of these said effects, granite countertops in such color selection have been beyond popular since forever. It is suitable to be in any kind of kitchen style. Take this mostly white kitchen with black tiled backsplash, for example. Patterns, tiles, and plain never balance each other this well. Merge white and brown shades to get beige granite countertop, another neutral tone with the ability to remove the ‘exposed’ feel came from pure white granite. 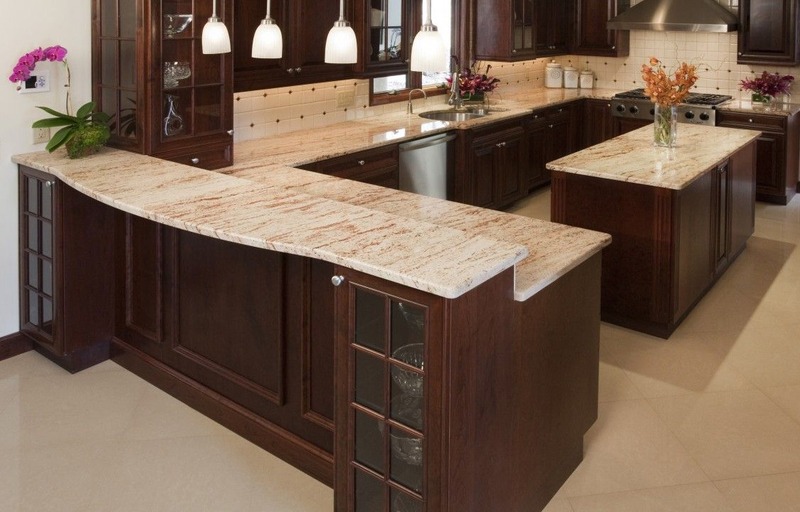 Pair white granite with wooden cabinetries in dark tones to build modern concept. Impressive, shiny, and totally contemporary are the words that best describe dark granite countertops, not to mention sophisticated also. No wonder it goes costlier than any other colors. However, its high price serves you high quality outcome as seen in the picture. Paired with dark kitchen cabinets, the countertop gives you a high-end kitchen interior. Such countertop looked the best in kitchen with classic or modern style. Consider to arrange some bold embellishments, such as yellow placemats or red vase above the dark countertop to have a nice contrast. To reduce the high price, purchase dark granite from a wholesaler. 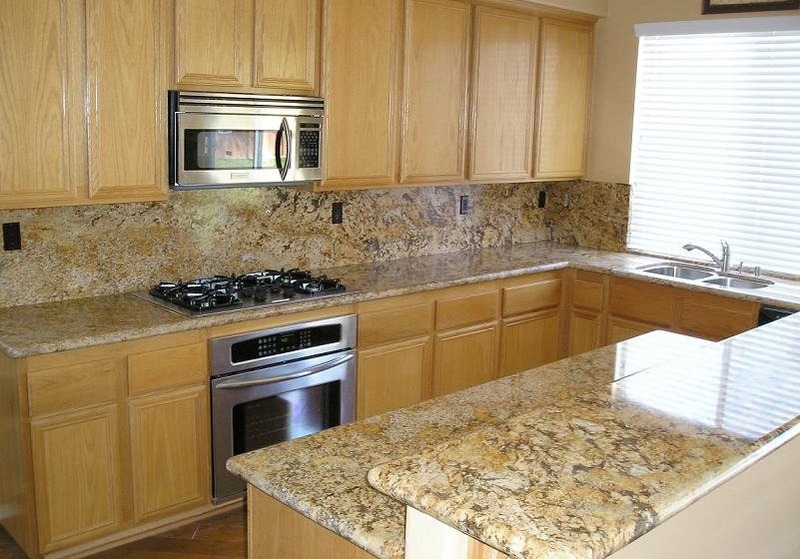 Colonial Gold is the name of a specific tone which categorized in neutral granite countertop. Its characteristic is the result of cream and white shades combination. To see it finishes not only the countertop but also the backsplash is quite a satisfying sight. This kitchen could tells you that much. The usage of shutter which allows a lot of natural light to shine inside the kitchen does nothing but adds dramatic effect. It is as though the whole surface sparkles. 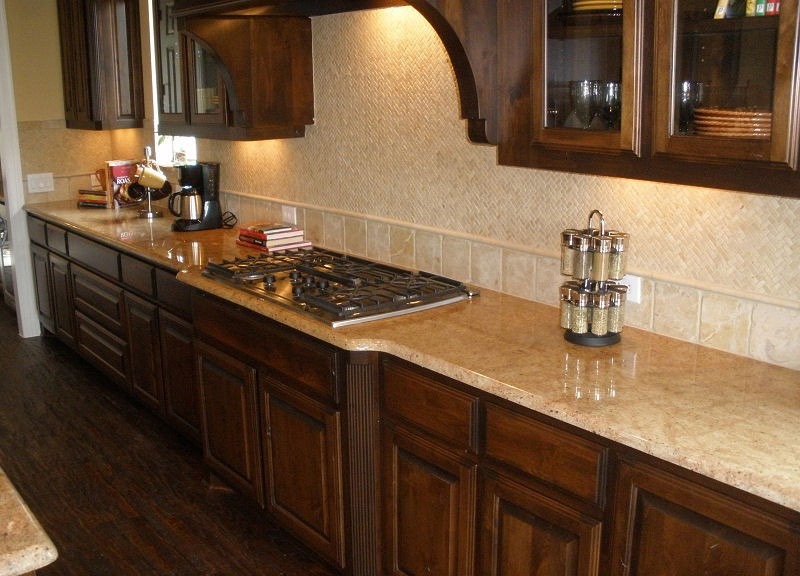 We must say that the Colonial Gold countertop complements the light brown cabinets and cream walls perfectly. If the Colonial Gold derives its color from cream and white shades combination, then the Madura Gold involves peach and cream tones. Though the name includes ‘Madura’, it’s not quarried in Madura Island, Indonesia. Rather, it comes from Tamil Nadu, India. This kitchen uses dark brown cabinetries as well as wooden flooring which affect the Madura Gold Countertop greatly. It looks indeed generally peachy gold, but the lighting and surrounding furniture tone could make the said countertop appear so much darker than its original color. Yes, it is another color from the neutral granite category. 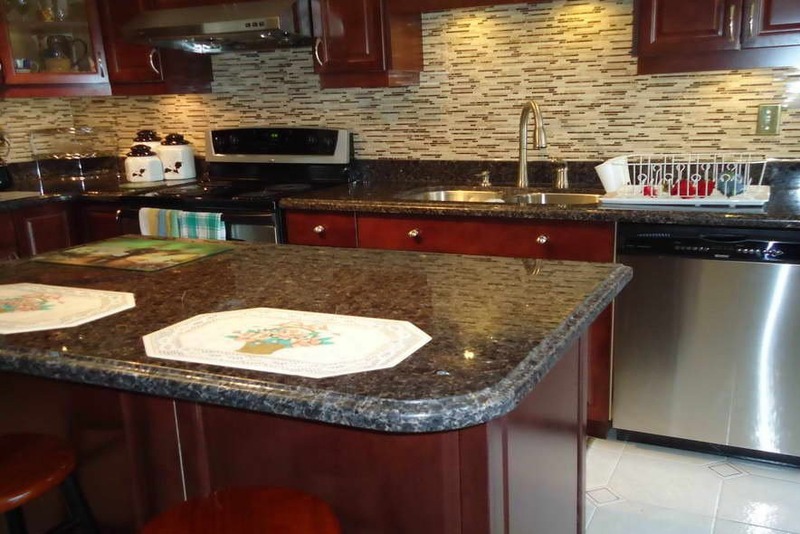 As material, the Brown Pearl granite doesn’t do a great job on countertops only, but also monuments, floor and wall applications, mosaic, wall and pool capping, fountains, window sills, and stairs. 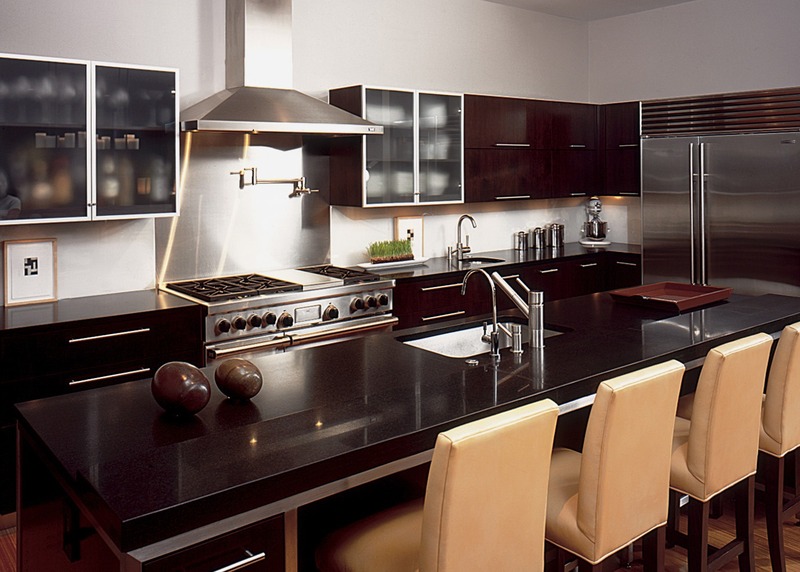 Its tone that looked so much like dark granite countertop makes it mimics the latter’s sleek characteristic. It leads to the ability to reflect its surrounding. Please take a look at the picture. From this angle, you could see the top of the Kitchen Island reflects the patterned backsplash. It’s as if the countertop has multi patterns and it’s unique. 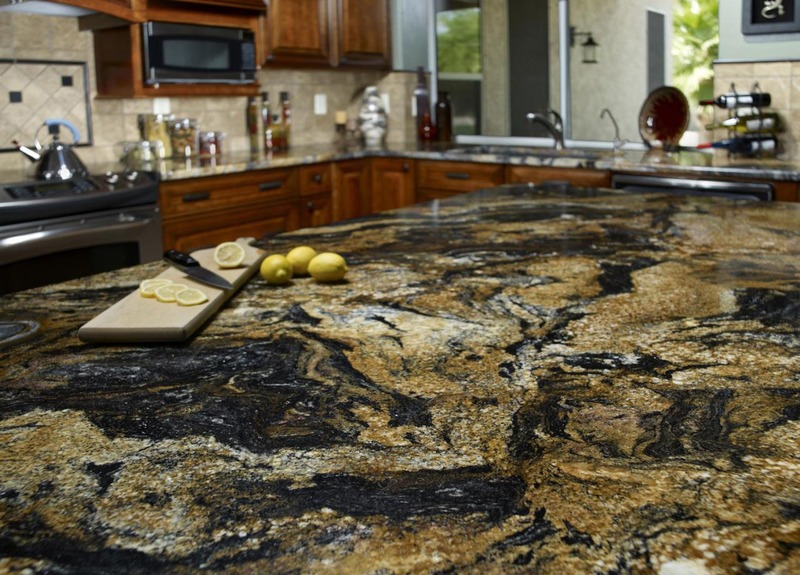 Stormy Night is neutral tone granite which serves to be a beautiful kitchen countertop. It gets its color from merging grey, brown, white, and black shades. If you consider having outdoor kitchen, which is unique and rarely seen, decide one with Stormy Night granite countertop, because it can withstand any weather and climate. Since it has some kind of dark tone, it is obviously gorgeous to pair it with lighter toned furnishings like light brown cabinets and cream backsplash. Nope, you don’t read it wrong. This one has a very pretty name, doesn’t it? And fortunately, not only the name which is pretty, the appearance also not disappointing. This type of granite countertop presents pink, red, and beige all at once which makes you wonder how come such countertop appears this feminine. With a such bright tone, the Shivakasi Pink granite in this kitchen balances the dark wood cabinets, so the space doesn’t get too gloomy. The nice lighting fixture above the countertop increases the brightness even more. This pinky one won’t ever let you down. Let’s state the obvious. 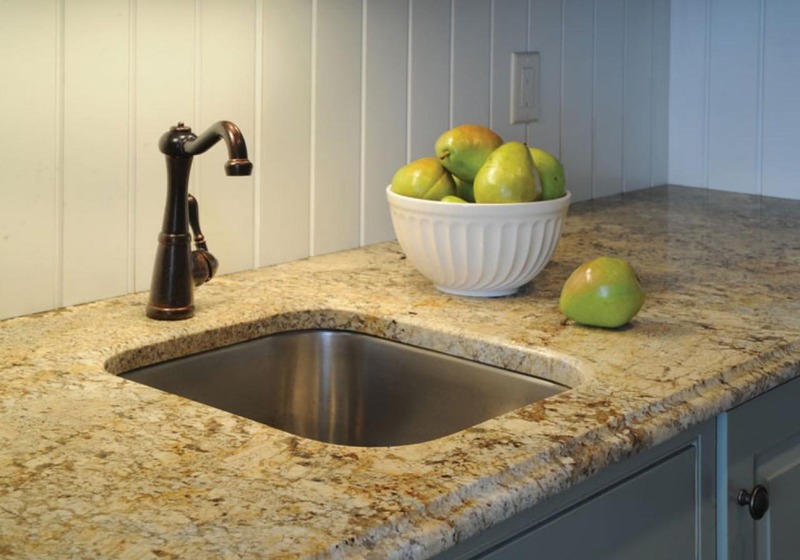 People consider granite countertops because it has a lot of options, timeless, susceptive to scratches, resists heat and stain, and liquid proof. But everything must have its downside and so does granite when it’s not sealed properly. As it’s porous, badly sealed countertops absorb any splashed liquid and become impossible to clean. Such condition allows bacteria to live inside its pores and, trust us; you wouldn’t want that happens. 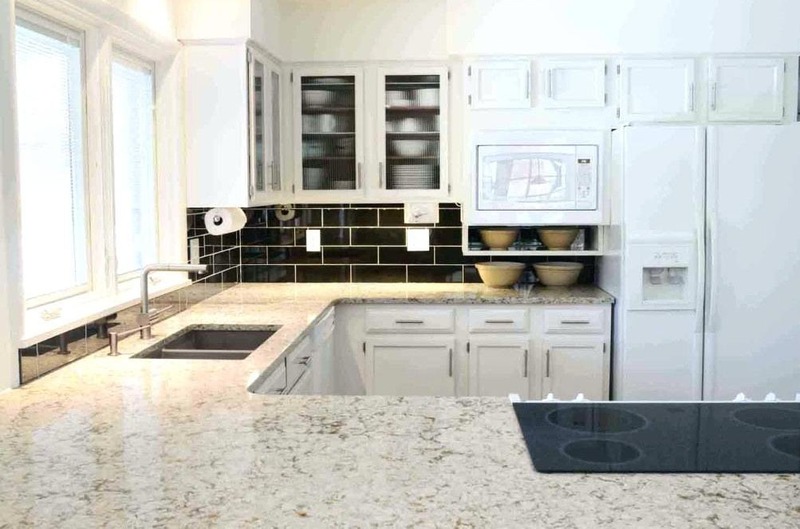 Here’s a little advice if you decide to have granite kitchen countertops, let the job be handled only by the expert to have an optimum result. Otherwise, well, you know what’s next. That’s all from today’s article. Thank you for reading!